After taking it easy after the Christmas shopping season mayhem, Arrow busier than Cupid with a new bowstring for February with seven Blu-ray releases that cover so many cult film genres. Two filmmakers get mini-retrospectives of their finest works. Both the Godfather of Gore and his spiritual grandchild from Japan get a high resolution upgrade of their masterworks. A film that’s been been beaten up in the public domain world finally gets its due. Here’s hoping you still have a few gift cards with balances left from Christmas. We are living in a Golden Age of Giallo. Not that they are making more of them in Italy. This is a Golden Age for Giallo films finally getting proper releases in America. After decades of having them sliced up by American distributors for various reasons or just getting no release on these shores, so many of these black gloved murder mysteries are coming out on Blu-ray so we can get a great view of Europe in the early ’70s. This also means that obscure directors are finally getting their due. Luigi Bazzoni is one such director who should be getting a lot of praise for his work in the genre as two of his three Giallo films come out. First is The Possessed which is considered a Proto Giallo by some since it was released in 1965 before the genre took over cinema’s post-Dario Argento’s Bird with the Crystal Plumage, but after Mario Bava’s Girl Who Knew Too Much. The Possessed has a writer decide to blow off his life in the city and head back to a seaside hotel in order to hook up with a maid. He has powerful memories of her getting intimate. Things immediately go wrong when he checks into the hotel and discovers his favorite maid is dead. He’s told it was a suicide, but details from the coroner’s report are wrong. He starts to investigate only to fear that whatever caused her “suicide” might be coming after him. Bazzoni and his co-director Franco Rossellini captured the dream-like atmosphere of an Alain Robbe-Grillet novel while making it accessible for viewers who want to know that something is happening on the screen. The Fifth Cord (1971) went into production after the success of Bird with the Crystal Plumage when producers realized Giallo was the new Spaghetti Western. Bazzoni, now solo directing, was able to get the two greatest elements of Bird to collaborate on his film. Ennio Morricone sets the mood with his score. Cinematographer Vittorio Storaro goes all out on lighting and angles to make this more than a clone of his previous work with Argento. Topping it all off is the casting of Franco Nero (Django) as the drunk reporter who realizes he’s at the center of the story he’s covering about a killer roaming Rome. The Blu-ray really brings out the glory of the film. Here’s hoping Bazzoni’s third Giallo film entry, Footprints on the Moon gets a domestic Blu-ray soon. You’ll want to have four scoops for this evening of Giallo and Gelato. The Godfather of Gore, Herschell Gordon Lewis’ Color Me Blood Red was the final part of his “The Blood Trilogy” with Blood Feast and Two Thousand Maniacs! (both available from Arrow). The film features a painter who discovers the secret to getting the best red color in his paintings. He learns to make others suffer for his art. This is all about making the blood flow on the screen in 1080p. Also coming out is Takashi Miike’s Audition which made auditions squirm nearly 20 years ago as it turned a goofy romantic comedy into a massive nightmare. A widower wants to get a new wife, but doesn’t want to get into the dating scene. So he hooks up with a producer buddy to create a fake project where they cast young women for the role of his wife. Things seem to go right when he finds the perfect meek woman who could be his wife. After she gets the role, the widower discovers his new woman has a very disturbing hobby that she didn’t put on the backside of her headshot. This film is not for those with weak stomachs. After 20 years, it sill has the ability to shock with the grizzly special effects. Miikie became an international sensation after Audition came out. Horror Express brought together Peter Cushing and Christopher Lee on a set that wasn’t a Hammer Horror. Instead of playing foes, they were abrasive exploring pals meeting up in the coldest part of Russia. Lee has uncovered a frozen person that appears prehistoric and joins Cushing on a train back to Europe. The train ride is a major journey especially when the ice defrosts and releases a force that wants to take over. Horror Express is one of those films that popped up in crummy transfers on public domain collections back in the Aughties. But it so deserves better. The film does an amazing job melding The Thing with Murder on the Orient Express. Even more exciting is the energy on the screen exploding when Telly Savalas (Kojak) bursts on the scene as a Russian investigator. The bonus features elevate the film so you don’t mind upgrading if it’s lurking in your collection. 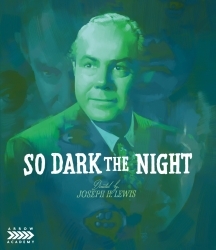 Director Joseph H. Lewis gets a bit of a retrospective with his Film Noir entries My Name Is Julia Ross and So Dark The Night getting a richer darkness in new transfers. 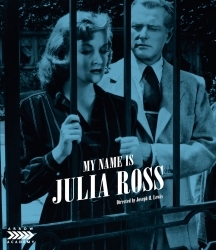 My Name Is Julia Ross is a bizarre tale of a woman (Spartacus‘ Nina Foch)who applies for a secretary job only to wake up with people declaring she’s the wife of her new boss’ son. Making things worse is she’s stuck on an island. So Dark the Night has a French detective fall in love only to have the woman vanish during an engagement party and turn up dead. If you’re missing Noir Alley this month on TCM, here’s a great way to spend the time you don’t have with Eddie Muller. Arrow Spreads the Love this February! Arrow wants to be your Valentine and they plan to win your heart with seven brand new releases! On February 5th bring home two films from legendary director Luigi Bazzoni. 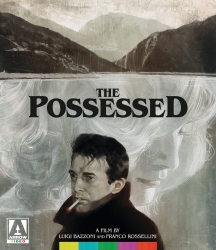 First up is The Possessed, co-directed by Bazzoni and Franco Rossellini. The film follows a novelist that investigates the disappearance of an old lover and ends up unwrapping a mysterious web of murder, madness and perversion. This classic slice of Italian cinema, known for wonderfully combining film noir and giallo, features a new 2K restoration. 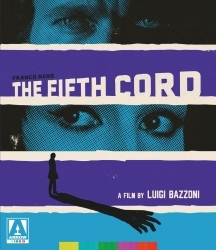 The second Bazzoni title is The Fifth Cord starring Franco Nero and Edmund Purdom. Following in the footsteps of Dario Argento, The Fifth Cord is a stunning giallo worthy of competing with the best the maestro has to offer. This release features a new 2K restoration and a number of special features including a new interview with Nero. 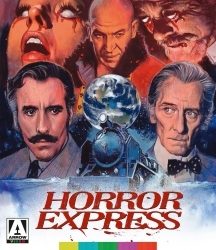 On February 12th, Arrow offers up to classics from different eras, starting with 1972’s Horror Express. Starring horror icons Christopher Lee and Peter Cushing, this tale of terror takes horror fans on a first class trip that’s just as chilling today as it was forty plus years ago. This new 2K restoration includes plenty of special features and has an intro from Horror Express super fan and horror journalist, Chris Alexander. For something a bit more modern, Arrow is proud to release Takashi Miike’s Audition. This shocking J-horror entry exploded on the festival circuit nearly two decades ago and continues to be a favorite today. Arrow will round out their February slate on February 19th with three more titles beginning with Color Me Blood Red from The Godfather of Gore, Herschell Gordon Lewis. This final chapter in the infamous “blood trilogy” features all the signature sleaze fans love Lewis for. Included in the multitude of bonus features is 1967’s Something Weird. The final two releases are a pair of mid-40s classics from director Joseph H. Lewis and come courtesy of Arrow Academy with My Name is Julia Ross and So Dark the Night. The former is a Hitchcockian film noir about mistaken identity, while the latter is about a Paris detective that finds love and then suddenly disappears. The Possessed is a wonderfully atmospheric proto-giallo based on one of Italy’s most notorious crimes, The Alleghe killings, and adapted from the book on that case by acclaimed literary figure Giovanni Comisso. Peter Baldwin (The Ghost, The Weekend Murders) stars as Bernard, a depressed novelist who sets off in search of his old flame Tilde (Virna Lisi, La Reine Margot), a beautiful maid who works at a remote lakeside hotel. Bernard is warmly greeted by the hotel owner Enrico (Salvo Randone, Fellini’s Satyricon) and his daughter Irma (Valentina Cortese, Thieves Highway, The Iguana with the Tongue of Fire), but Tilde has disappeared under suspicious circumstances. Bernard undertakes an investigation and is soon plunged into a disturbing drama of familial secrets, perversion, madness and murder… Co-written by Giulio Questi (Death Laid an Egg, Arcana) and co-directed by Luigi Bazzoni (The Fifth Cord, Footprints on the Moon), The Possessed masterfully combines film noir, mystery and giallo tropes, whilst also drawing on the formal innovations of 1960s art cinema (particularly the films of Michelangelo Antonioni.) A uniquely dreamlike take on true crime, The Possessed is presented here in a stunning new restoration. The success of Dario Argento’s The Bird with the Crystal Plumage ushered in a host of imitators, seeking to capitalize on this new, modern take on the giallo thriller. Many were highly derivative, but a number nonetheless rose above the crowd thanks to skillful execution and a willingness to experiment stylistically. One such example is The Fifth Cord – which, in the hands of director Luigi Bazzoni (The Possessed, Footprints on the Moon), turns a conventional premise into a visually stunning exploration of alienation and isolation. When a man barely survives a brutal assault en route home from a New Year’s party, washed-up, whisky-swilling journalist Andrea Bild (Franco Nero, Django) is assigned to report on the case. Before long, the maniac strikes again, this time with fatal results. As the body count rises, Andrea falls under suspicion himself, making it even more imperative that he crack the case. His only clue lies in a series of black gloves found at the location of every attack, each with a finger cut off… Adapted from a novel by David McDonald Devine, The Fifth Cord boasts a complex, Agatha Christie-esque plot, outstanding cinematography courtesy of future Oscar-winner Vittorio Storaro (Apocalypse Now) and supporting appearances by a raft of genre stalwarts, including Silvia Monti (A Lizard in a Woman’s Skin), Edmund Purdom (Nightmare City) and Rossella Falk (Sleepless). Debuting here in high definition, arguably the most visually stunning giallo ever made now shines like never before. One of the most shocking J-horror films ever made, Audition exploded onto the festival circuit at the turn of the century to a chorus of awards and praise. The film would catapult Miike to the international scene and pave the way for such other genre delights as Ichii the Killer and The Happiness of the Katakuris. Recent widower Shigeharu Aoyama is advised by his son to find a new wife, so he seeks the advice of a colleague having been out of the dating scene for many years. They take advantage of their position in a film company by staging an audition to find the perfect woman. Interviewing a series of women, Shigeharu becomes enchanted by Asami, a quiet, 24-year-old woman, who is immediately responsive to his charms. But soon things take a very dark and twisted turn as we find that Asami isn’t what she seems to be… Pulling the audience into a story that will lead to one of the most harrowing climaxes in cinema history, Miike twists and turns us through delirious editing and shocking visuals for one of the most depraved nightmares of all time! 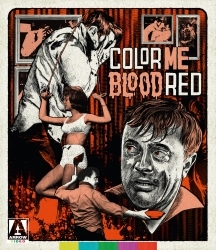 For the third and final installment in his infamous ‘Blood Trilogy’, Color Me Blood Red, splatter movie pioneer Herschell Gordon Lewis turned to the world of fine art for this tortured tale of a troubled artist turned homicidal maniac. Painter Adam Sorge has found himself in a bit of a creative lull. But when his girlfriend accidentally cuts her finger, he realizes what his work has been missing all this time – human blood! With pressure mounting from local gallery owner Farnsworth to deliver his next masterpiece, Adam sets about procuring as much glorious haemoglobin as he can muster – first from himself, and then from anyone unfortunate enough to pass by his sickening studio of slaughter. The final filmic collaboration between H.G. Lewis and producer/master exploiteer David F. Friedman, who collectively delivered the equally demented Blood Feast and Two Thousand Maniacs!, Color Me Blood Red is a crazed creation that truly puts the pain in painting! After a promising start on Poverty Row quickies, Joseph H. Lewis (The Big Combo) made his first film at Columbia and established himself as a director to watch with this Gothic-tinged Hitchcockian breakout hit, which later proved so popular that Columbia promoted it to A-feature status. The morning after Julia Ross (Nina Foch, Executive Suite) takes a job in London as secretary to wealthy widow Mrs Williamson Hughes (Dame May Whitty, The Lady Vanishes), she wakes up in a windswept Cornish mansion, having been drugged. Mrs Hughes and her volatile son, Ralph (George Macready, Gilda), attempt to gaslight Julia into believing she is Ralph’s wife, Marion. Her belongings have been destroyed, the windows barred and the locals believe that she is mad. Will Julia be able to escape before she falls prey to the Hughes’ sinister charade? And what happened to the real Marion Hughes? A briskly paced and brilliantly stylised mystery that grabs its audience from the start, My Name Is Julia Ross immediately cemented Lewis’ place in the noir pantheon, and anticipated the elaborate identity-based deceptions found in future classic thrillers like Alfred Hitchcock’s Vertigo and Brian De Palma’s Obsession.